The New Orleans Saints, just a year removed from being a team without a home on the way to a miserable 3-13 record, hosted the Philadelphia Eagles in a NFC Divisional Playoff contest on January 13, 2007. The Saints had a new head coach in Sean Payton and were back in the refurbished Louisiana Superdome, which had been badly damaged along with much of the rest of the city during Hurricane Katrina in 2005. The offense was the NFL’s most productive, directed by QB Drew Brees. Power-running RB Deuce McAllister (pictured above) had come back from a knee injury in ’05 to form an excellent tandem with flashy first draft choice RB Reggie Bush. The less-known WR Marques Colston, a seventh round draft pick, also proved to be a valuable addition (70 catches, 1038 yards, 8 TDs). The defense had a bend-but-not-break quality and was strongest on the line that was anchored by ends Will Smith and Charles Grant. New Orleans topped the NFC South with a 10-6 record and earned a first-round bye in the playoffs. They had beaten Philadelphia during the regular season. The Eagles were in the playoffs for the sixth time in Head Coach Andy Reid’s eight-year tenure, having dipped to 6-10 in 2005 after reaching the Super Bowl in ’04. After getting off to a 5-6 start, they managed to win six games in a row to place first in the NFC East, also with a 10-6 tally, despite losing starting QB Donovan McNabb. Veteran backup QB Jeff Garcia performed capably in relief, however, and all-purpose RB Brian Westbrook gained 1916 yards from scrimmage while wide receivers Reggie Brown and Donte’ Stallworth were productive. The aggressive defense was especially strong in the backfield that featured FS Brian Dawkins. Philadelphia defeated the Giants in the Wild Card round to advance to the Divisional level. There were 70,000 excited fans present at the Louisiana Superdome. The teams exchanged punts to start the game, with Reggie Bush taking a huge hit from Eagles CB Sheldon Brown on the second play from scrimmage that sent him briefly to the sidelines. The second possession for the Saints started off with Deuce McAllister running for a gain of 28 yards from midfield to the Philadelphia 22 and, after reaching the 15, John Carney kicked a 33-yard field goal. The clubs resumed trading punts until, starting from their own 36 late in the opening period, the Saints again commenced a series with a long run. This time it was Bush reversing field and going around left end for 25 yards, and Drew Brees followed up with a pass to WR Devery Henderson that gained another 35 yards to the Philadelphia four. However, as the game moved into the second quarter, New Orleans lost a net total of a yard in the next three plays and settled for another Carney field goal, this time from 23 yards. Down 6-0, the Eagles struck back three plays into their next series when Jeff Garcia threw to WR Donte’ Stallworth for a 75-yard touchdown (pictured at left). David Akers kicked the extra point to put the visitors in front by 7-6. The Saints responded with a long drive of 78 yards in 14 plays. Brees threw to Marques Colston for 14 yards and McAllister ran three straight times for a total of 15 yards. After Bush was tackled by MLB Jeremiah Trotter for a loss of six yards to set up third-and-11, Brees connected with Bush for 14 yards to keep the drive going and then to Colston for another five. Bush lost two yards but then ran for the needed seven yards on third down and another third down at the Philadelphia 28 resulted in a Brees throw to Colston for 19 yards. Two plays later, Bush ran four yards for a TD and, with Carney’s conversion, New Orleans was ahead by 13-7. The Eagles put together a long possession of their own, covering 80 yards in 11 plays. Garcia completed a pass to WR Reggie Brown (pictured below) for 32 yards to convert a third-and-11 situation and a third-and-six pass to WR Hank Baskett picked up 25 yards to the New Orleans 20. Garcia completed two more passes, to RB Correll Buckhalter for eight yards and TE L.J. 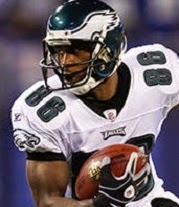 Smith for another eight, and Brian Westbrook scored on a one-yard touchdown dive. Akers kicked the point after to put Philadelphia up by 14-13 with 54 seconds remaining in the first half, and that remained the score at halftime when a final-play throw into the end zone by Brees was pulled away from Colston by CB William James. The Eagles had the first possession in the third quarter and struck quickly when Westbrook broke away for a 62-yard TD on the third play from scrimmage. Akers extended the lead to 21-13 with the PAT. Following a 36-yard kickoff return by WR Michael Lewis, the Saints responded with a seven-play, 63-yard drive. McAllister ran effectively and Brees completed passes to TE Billy Miller for 15 and 29 yards. McAllister ran for a five-yard touchdown and Carney’s extra point put New Orleans just a point behind at 21-20. On the ensuing kickoff, RB Reno Mahe returned 11 yards and then lateraled to WR Jason Avant for another 28 yards to give the Eagles good starting field position at their 46. Westbrook had a run for 18 yards, but Garcia was unsuccessful on all three of his passes, forcing a punt. Starting from their 16, the Saints advanced methodically. Brees completed passes to McAllister for 10 yards and Miller for 13 and, when Bush fumbled following a 10-yard carry, WR Terrance Copper recovered at the Philadelphia 49. Brees threw to TE John Owens for 21 yards and, after a gain by Bush was negated by a holding penalty, a sack by DE Trent Cole was also nullified due to illegal contact. With a first down at the 34, McAllister ran for a 23-yard gain and that set up a Brees throw to McAllister for an 11-yard TD. Carney converted and New Orleans was back in the lead by a 27-21 score. Garcia closed out the period with pass completions to Smith for 15 yards and Stallworth for 11 and, after a holding penalty backed the Eagles up to start the fourth quarter, he connected with Brown for a gain of 24 yards to the New Orleans 28. Westbrook carried twice for 24 yards to give Philadelphia second-and-one at the four. But in a pivotal set of plays, Westbrook was stopped for no gain and a pass to FB Thomas Tapeh lost two yards. The Eagles were forced to settle for a 24-yard Akers field goal. The Saints punted following their next series and Philadelphia went three-and-out and did likewise. On a drive that consisted primarily of McAllister running the ball, New Orleans advanced to the Philadelphia 32, but Bush couldn’t handle a high pitchout from Brees and the loose ball was recovered by DE Darren Howard to give the Eagles possession at their 44 with 3:18 remaining on the clock. Once again the visitors were unable to move the ball on offense and opted to punt after three plays. They never regained possession as, with all of Philadelphia’s timeouts expended, McAllister ran for five yards on a third-and-one play with 1:37 left. New Orleans won by a final score of 27-24. The Saints led in total yards (435 to 355) and first downs (27 to 14), with 208 of their yards coming on the ground. 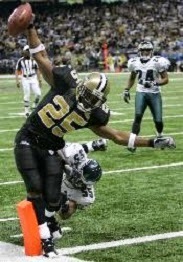 New Orleans also suffered the only turnover and the Eagles recorded three sacks, to one by the Saints. Deuce McAllister became the first player in franchise history to run for over a hundred yards in a postseason game as he gained 143 yards on 21 carries. He also caught four passes for 20 yards and scored a touchdown apiece by running and receiving. Drew Brees completed 20 of 32 passes for 243 yards and a TD with no interceptions. Reggie Bush (pictured below) contributed 52 yards on 12 rushing attempts that included a score and gained another 22 yards on three catches. Marques Colston had 5 pass receptions for 55 yards and Billy Miller accumulated 64 yards on his four catches. For the Eagles, Jeff Garcia was successful on 15 of 30 throws for 240 yards and a touchdown while giving up no interceptions. Brian Westbrook rushed for 116 yards on 13 attempts that included two TDs. Donte’ Stallworth gained 100 yards on three catches that included the one long touchdown and Reggie Brown had 76 yards on his three receptions. On defense, DT Darwin Walker recorded two of the team’s sacks. New Orleans reached the NFC Championship game for the first time ever, but lost to the Chicago Bears by a 39-14 score. With heightened expectations, the Saints dropped to 7-9 in 2007 and didn’t reach the playoffs again until 2009, although with better results. The Eagles dropped to 8-8 in ‘07 but returned to the playoffs in 2008, advancing to the NFC Championship game.